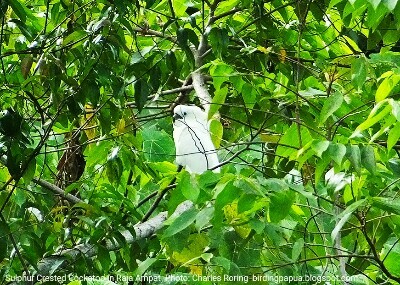 Here are some pictures of Kakaktua Putih (meaning White Cockatoo). Actually the scientific name of the bird is Sulphur Crested Cockatoo (Cacatua galerita). The bird lives in lowland to lower montane forest of New Guinea and its surrounding islands. To survive in the tropical jungle, the bird eats various kinds of fruits including papaya and banana. That's why farmers consider the bird as pest. Sulphur Crested Cockatoo makes hole in big tree to avoid attacks from predator. Because of its beautiful white feather, this cockatoo bird is often caught by local villagers and sold in cities and towns of West Papua as pet. White cockatoo is often traded by sailors to big cities in Java. The trading of birds has existed for hundreds of years and can threaten the population of certain species of animal particularly the paradise birds, Black-capped Lory, Eclectus Parrot, Helmetted Friarbird and Hooded Butherbird. Collectors are not only looking for birds that have got beautiful feather but also the ones that have beautiful songs. Birdwatching tour is an alternative income generation scheme that I introduce into villages to help local people earn money without having to destroy environment. Domestic and international visitors can enjoy watching birds in their natural habitat using services provided by local people. Villagers can work as guides, porters, cooks and guesthouse owners when they serve visitors. Sulphur Crested Cockatoo (white cockatoo) can be watched in numerous places in West Papua such as in Mesirrokow Forest of Manokwari, Tambrauw Mountains and Raja Ampat archipelago. After that, you could continue your flight to Manokwari city. I could organize your trip to the lowland forest of Manokwari to watch the white cockatoo and a lot of tropical birds of West Papua. In general, birdwatchers bring a good pair of binoculars, spotting scope and a digital camera with telephoto lens.